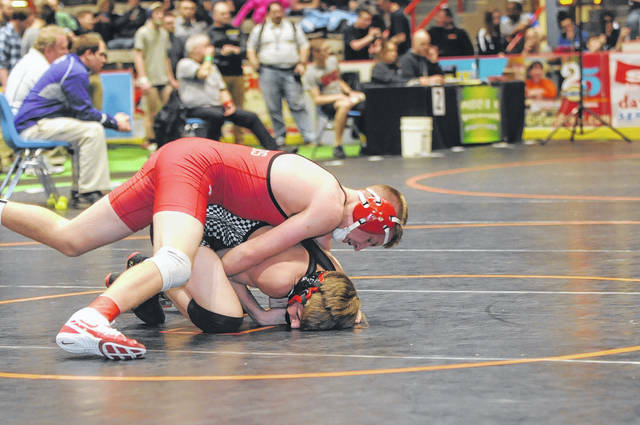 Tri-County North’s Chayse Eby battles Jay Goetz of Spencerville during the first round of the Division III district wrestling tournament on Friday, March 2, at Hobart Arena. 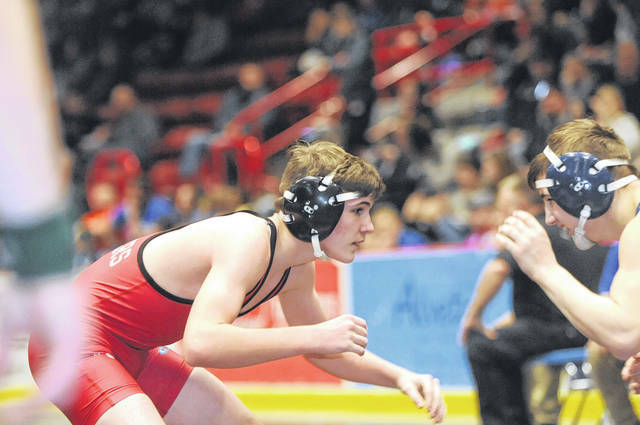 TROY — National Trail sophomore Peyton Lane placed third at the district wrestling meet to qualify for the Division III state wrestling tournament, scheduled for this weekend. As a team, Trail finished 30th with 20 points. Preble Shawnee was 31st with 19.5 and Tri-County North was 36th with 11. Miami East was the team champion with 140 points. In all, a total of 11 wrestlers represented the county at the district tournament. Preble Shawnee had six, Tri-County North four and National Trail one. 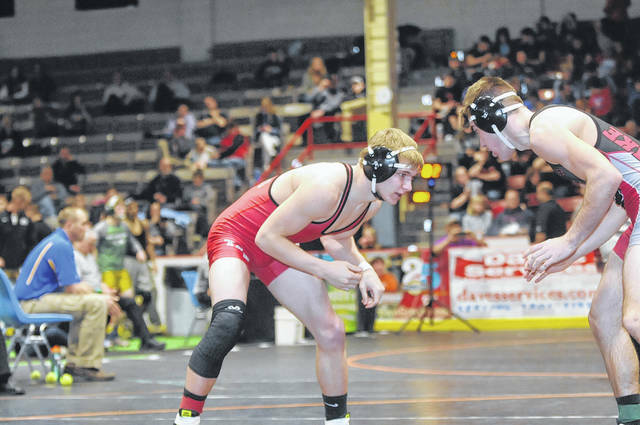 Lane improved his record to 32-2 going 4-1 at the Division III District Tournament at Troy’s Hobart Arena on Friday and Saturday, March 2-3. Lane won his fist match by pin over Cole Mergler of Miami East in 50 seconds. 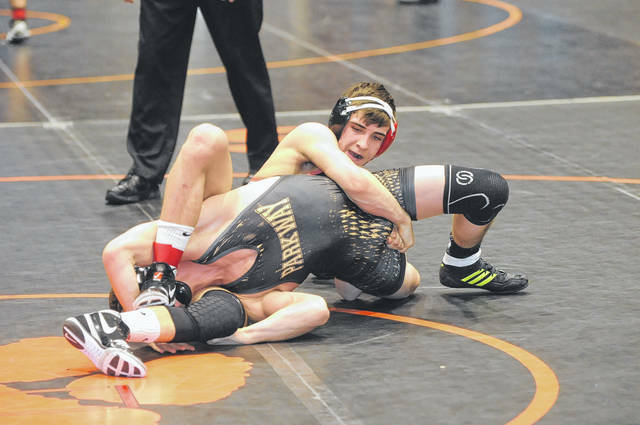 In the second round, Lane scored a 10-1 decision over Justin Sigler of Coldwater. 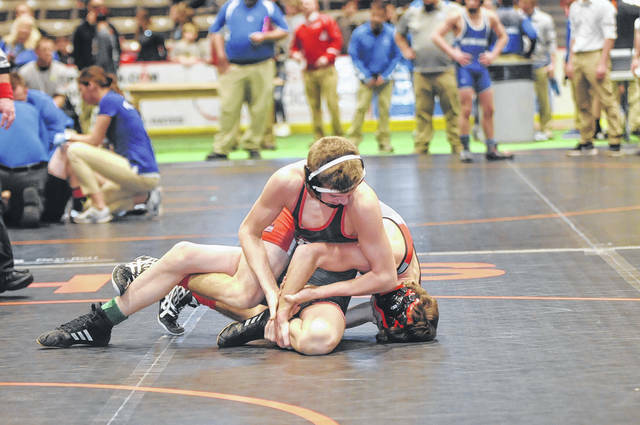 In the semis, Lane lost to two-time state placer Jacob Edwards of Troy Christian, 3-1. It was the first loss for Lane since the semifinals of the Eaton Invitational in late January. 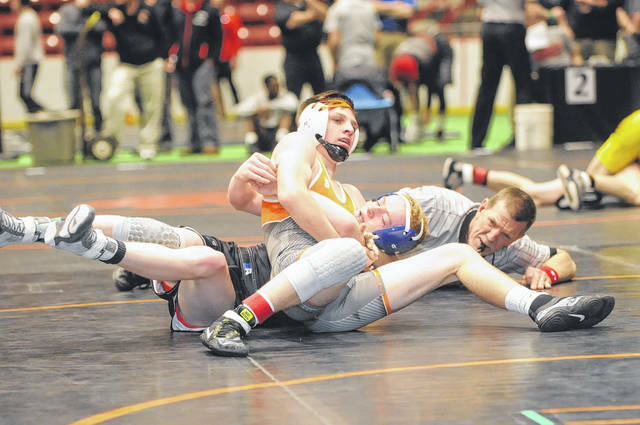 Lane bounced back with a 9-0 win over Ben Stroud of Mechanicsburg, before pinning Preston Platfoot of Versailles in 3:57 for third place. Shawnee’s Travis Howard came up one match shy of advancing to state. The freshman went 3-3 at the districts to finish sixth and finished the season 34-12 at 138 pounds. Ty Stevenson went 3-3 and fell one match short of qualifying for state. He finished the year 27-7. 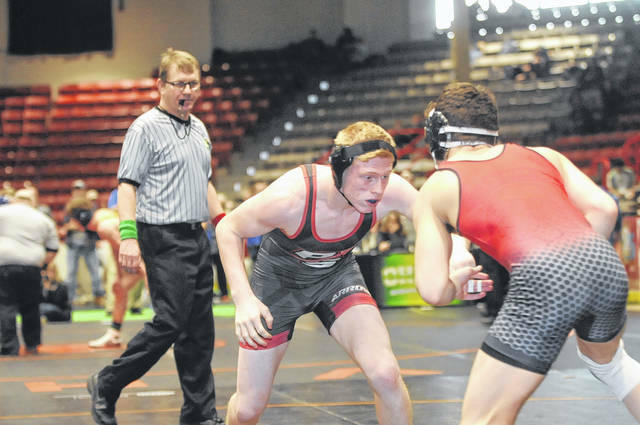 Preble Shawnee’s Rylan Roberts went 0-2 at 120 pounds to finish the season 26-16. Shawnee’s Triston Engle went 0-2 and ends the year 16-18. Kanyon Schall was 0-2 and finished the year 21-18 for the Arrows. Shawnee Bryce Abner qualfied for the district tournament but was unable to compete. 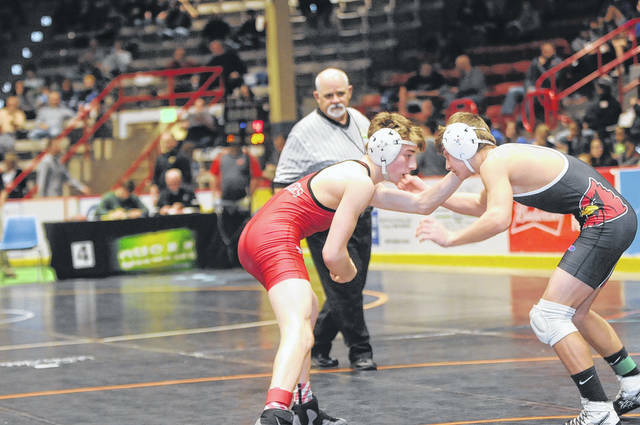 Tri-County North’s Andrew Hutchinson went 1-2 at 120 pounds. He concludes the season 29-9. North’s Hunter Heck went 1-2 at 126 pounds to finish the season 20-16. The Panthers Chayse Eby, who made the field as an alternate, went 0-2 and finished the year 18-18. Tristen Hayslett went 2-2 for North and ends the year 24-14. The state tournament will be held Thursday-Saturday, March 8-10 at the Schottenstein Center in Columbus. Doors open at 2 p.m. on Thursday and wrestling is scheduled to begin at 3 p.m. with Division III. 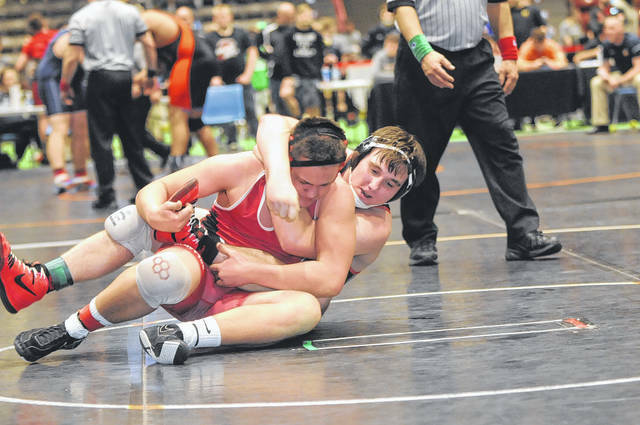 https://www.registerherald.com/wp-content/uploads/sites/41/2018/03/web1_tcn_wr_eby.jpgTri-County North’s Chayse Eby battles Jay Goetz of Spencerville during the first round of the Division III district wrestling tournament on Friday, March 2, at Hobart Arena.